Back cover blurb: Sisters Cassie and Coco have been there for each other every since their mother disappeared when they were children. Responsible Cassie spends every moment trying to be perfect wife and mum, but can't help feeling she's getting it all wrong. Commitment-phobic Coco adores running her vintage dress shop - but since a disastrous break-up, her love life's become an antique. Their lives are full to the brim - so why do they both feel that something is missing? As the sisters try to find their way to lasting happiness, fate has a few surprises in store as the past makes a sudden appearance in the present . . . I don’t think I’ve ever read one of Cathy Kelly’s novels before… I know, where have I been?? If I have it was years before I decided to bore you all senseless with my own thoughts about other peoples novels!! Between sisters is ultimately the story of Coco and Cassie Kenneally, abandoned by their Mother at a young age, both are now grown up; Coco a successful business woman with a beautiful vintage fashion shop and Cassie happily married with a family of her own; husband Shay, and daughters Lily and Beth. But Cassie is afraid that Shay is going to abandon the family home for his Mother who is so dreadfully demanding since the death of her husband, Shay’s father. And Coco is still mourning the loss of Red her long term partner from who she has been separated for four years at her behest. Is it their Mother’s departure that makes the Kenneally girls fear abandonment or does the course of true love never run as smoothly as we are led to believe? 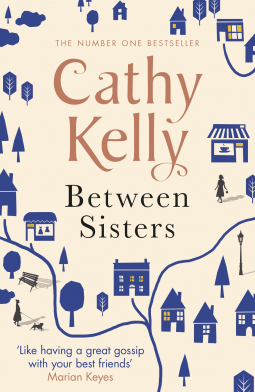 Between Sisters is available now via Amazon online and all good book shops.